The test fits North Korea’s pattern of behavior, but also represents worrying advances. A defiant and unpredictable regime in Pyongyang has made its now familiar move once again by conducting another nuclear test. While North Korea has engaged in four other nuclear tests since 2006, its latest one on September 9 was markedly different in several respects. Although it will take days or weeks to verify the nature and actual impact of North Korea’s nuclear detonation, early seismic data suggest that the latest test’s magnitude of 5.3 appears to be higher than the fourth test in January this year. More alarmingly, the nuclear explosion had the yield of 10 kilotons, in comparison to 6 kilotons last time. Pyongyang also claimed that it conducted a “nuclear warhead explosion” test, raising concerns about its rapid progress with the miniaturization and standardization of nuclear warheads. North Korea’s fifth nuclear test came on the heels of repeated missile tests that featured more diverse (e.g., submarine-launched ballistic missiles, Rodong medium-range missiles) and more capable delivery means. Given that the latest nuclear test took place only eight months after the last one — while previous tests occurred roughly three years apart — it is hard to escape an overall sense of a rapid acceleration of nuclear and missile development in the North and greater escalation of tensions with its neighbors and the United States. Irrespective of the actual destructive power and future potential of Pyongyang’s nuclear program, the fact remains that North Korea is the only country that has withdrawn from the Nuclear Nonproliferation Treaty and conducted nuclear tests in the 21st century. It is, however, important not to overestimate Pyongyang’s weapons of mass destruction (WMD) capabilities, despite its tendency to exaggerate its progress in nuclear and missile development. Analysts still believe that North Korea has not mastered the technologies needed to place a nuclear warhead onto a missile, which was reaffirmed by South Korea’s National Intelligence Service briefing to the National Assembly after the latest nuclear test. In addition, North Korea has not shown the ability to successfully launch an intercontinental ballistic missile, not to mention demonstrating the survivability of nuclear warheads during reentry into the atmosphere. While brutal and eccentric, the regime is not suicidal either. In fact, a primary motivation for North Korea’s pursuit of WMDs has been tied to its greater goal of ensuring the survival of the regime. It may be no coincidence that the nuclear detonation came in the wake of South Korea’s recent decision to deploy a U.S. missile defense system, reports of a high-level North Korean defection to Seoul, and broad condemnation of its WMD provocation at the G20, ASEAN, and East Asia summits. From Pyongyang’s perspective, the nuclear test, which appears intentionally timed for 9 am, September 9, its National Day, may serve as a means to boost the eroding legitimacy of the regime. More broadly, North Korea’s rapid progress in WMD development will rekindle the decade-long debate on how to effectively curb its nuclear aspirations. Most scholars of international relations have maintained that Pyongyang is unlikely to actually use its nuclear weapons, since its nuclear capability serves mainly as a deterrent or bargaining chip. The presence of the U.S. nuclear umbrella in East Asia means that any North Korean nuclear attack on South Korea or Japan will trigger a far more devastating nuclear counterattack on Pyongyang. Preemptive strikes by the United States would have the disturbing potential to escalate into a major military conflict along the world’s most heavily militarized border and to incur mass casualties and tremendous economic costs. A more likely scenario, following the cascade of global condemnations, is a new round of sanctions from the UN Security Council and the Obama administration. Remaining, however, is the more vexing long-term question of what kind of diplomatic negotiations, if any, to pursue vis-à-vis Pyongyang. The latest nuclear test, North Korea’s fourth during the Obama presidency, shows that the current policy of “strategic patience” aimed at North Korea’s isolation has not been successful in solving the nuclear conundrum. This is not to suggest that more hardline diplomatic pressure would necessarily work better. The George W. Bush administration’s North Korean policy was equally ineffective and had the added unintended consequences of strained alliance ties and fractured regional cooperation. China’s reluctance to rein in North Korea stems from its larger strategic quandary. While alarmed about Pyongyang’s nuclear provocations, Beijing is more concerned about the negative ripple effects of the collapse of the Kim regime, such as refugee flows, regional instability and the permanent loss of a strategic buffer state. Even in South Korea, the public is torn between growing concerns about North Korea’s nuclear gambit and diminishing hopes for eventual national reunification. This complex regional reality calls for a new approach that pays greater attention to regional understandings of the North Korean challenge. In this vein, the so-called Perry Process, led by then U.S. North Korean special envoy William Perry during the Clinton administration, is worth revisiting. In the wake of North Korea’s ballistic missile test and suspected nuclear activities in 1998, the U.S. government launched a comprehensive process of regional consultation and coordination with South Korea and Japan, while engaging Pyongyang. Along with the 2000 U.S.-DPRK Joint Communiqué pledging political reconciliation and a North Korean moratorium on missile tests, the Perry Process resulted in better alliance coordination and improved regional cooperation. To be sure, an engagement policy toward Pyongyang will be far more difficult in 2016 as the election year rhetoric against foreign threats will be ratcheted up and North Korea now has a small but increasing nuclear arsenal. But it should be equally clear by now that the mere slapping of sanctions and louder condemnation against Pyongyang are unlikely to slow down North Korea’s pursuit of WMDs. In the face of déjà vu on the Korean Peninsula, comprehensive engagement and greater regional coordination on both the nuclear and non-nuclear dimensions may be a meaningful first step in resolving the decade-long nuclear quagmire in East Asia. Il Hyun Cho, assistant professor in the Department of Government and Law and the Asian Studies Program at Lafayette College, is the author of Global Rogues and Regional Orders: The Multidimensional Challenge of North Korea and Iran (Oxford University Press, 2015). 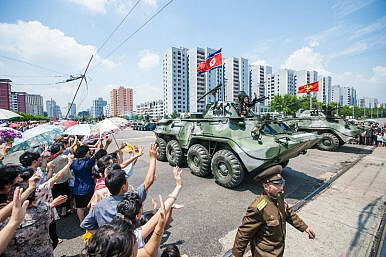 Fissures in the North Korea Peace Process? Alongside the diplomacy, Trump has maintained a hard line. Notably, Pyongyang has responded in kind.